The next couple of posts we will talk about user accounts. This time we will look at expanding the information stored on the user account. First we will take a look at how user account data is stored. As mentioned earlier, the standard setup uses localdb (this simply means that the database is kept in a simple file, that can be uploaded to any web hotel if so desired). The database file does not exist until you put something in it. To do so, run the application and register a user with username and password. Then stop the application. 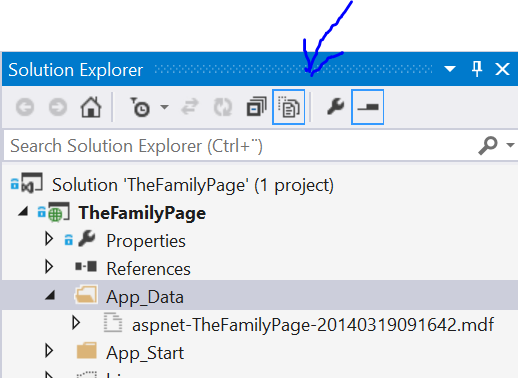 In the solution explorer, click on App_Data, and then click on the icon “Show All Files”. Double-click the database file to open the file in the server explorer. As can be seen, I have created a user with the username ‘Michael’ and the password is not stored in clear text. This is the only one of the tables, that are used in the standard setup. The other tables are used if you want to assign individual roles to the users, or you want to let the user be able to log in with an external authentication provider (like Google, Twiiter or Facebook). For this simple page we will not need other means to log in. We will need roles, and that is the subject of one of the next posts. We will need to expand the user data a little. Besides user name and password, we will also need real name and e-mail address. This is data that is reasonable to store along with the login information. If you also want to store more data about the user (like address, homepage, spouse or whatever) you should do it in another table and handle that someplace else. Update the views to utilize the extra information. For this simple web page we will keep it all in one project. This will enable EntityFramework to create a new database with the same tables that we just looked at in the start of this post. We can see that the ApplicationUser has an empty inheritance from the IdentityUser, which just gives us a user with username and password. Pretty simple – now we want to expand on that. 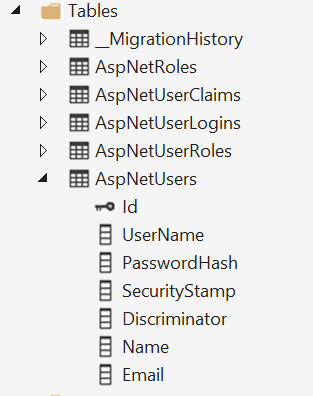 In order to expand the IdentityUser we add some extra fields to the ApplicationUser class. In order to do the actual update of the database, type “Update-Database” in the PackageManager console. Now I try to run the page and register a new user. When I look at the data table I can see that the name and e-mail is stored for my new user. I can also se that my first registered user doesn’t have name or e-mail set. I have no way to remedy that yet. We want to be able to change our name and e-mail. We want to clean up the views and controllers, so we don’t have code we don’t need. We need to add Roles, for an administrator, an editor (that also can edit other users wish-lists) and a normal user, who can only edit his/her own data. So that is the plan for the next couple of posts. This entry was posted in C#, HTML5, Web and tagged .Net, C#, Database, Programming. Bookmark the permalink.